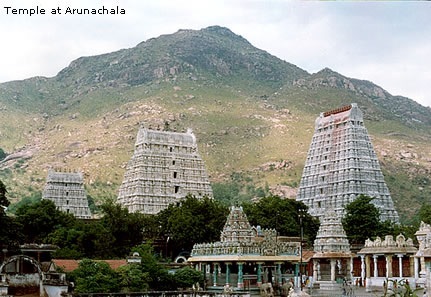 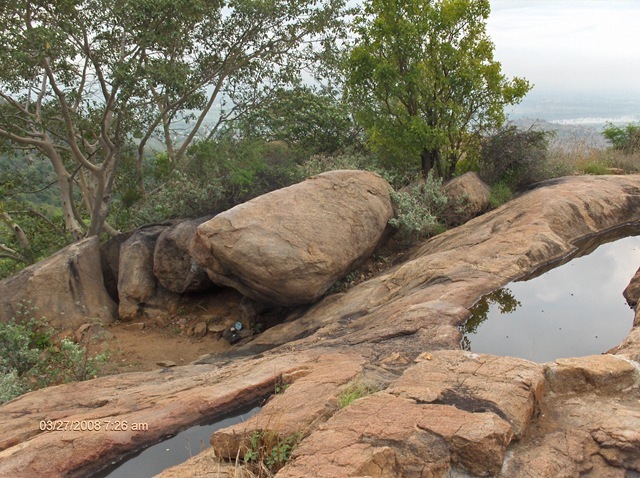 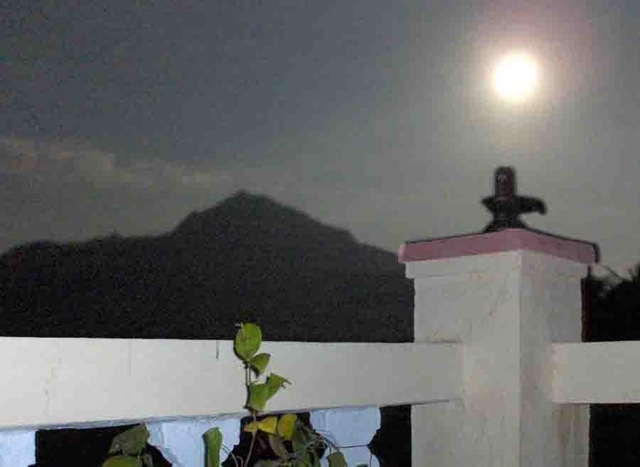 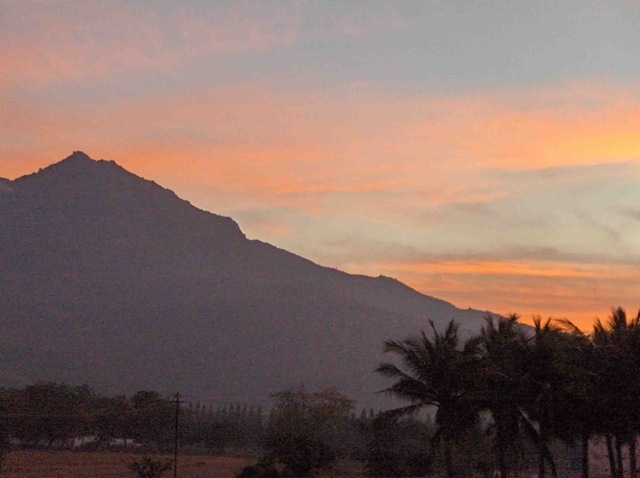 We explore Arunachala frequently. 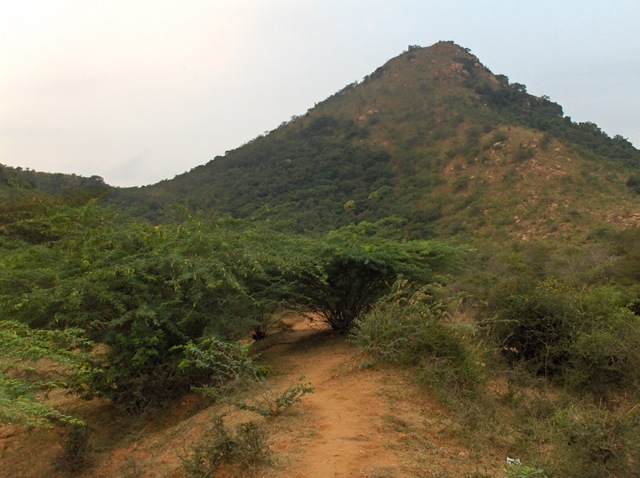 We walk from ‘yenga veedu’ (our house) to the mountain. 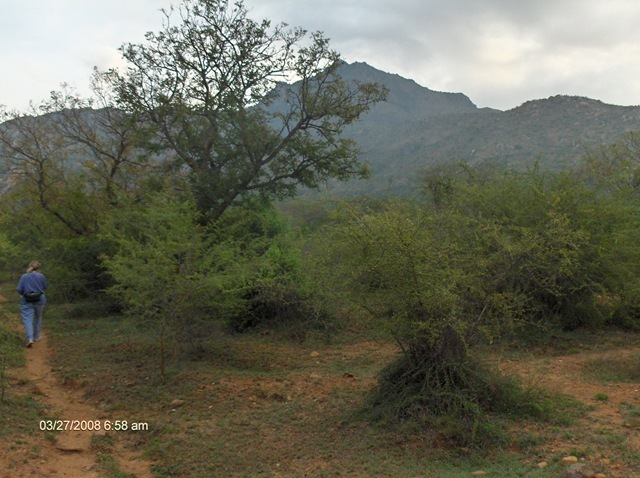 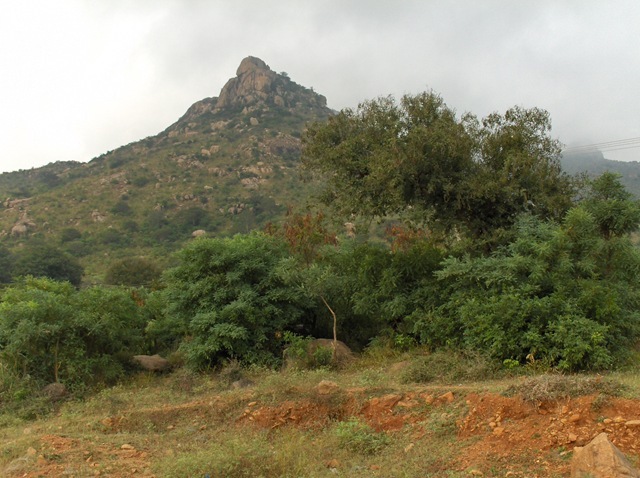 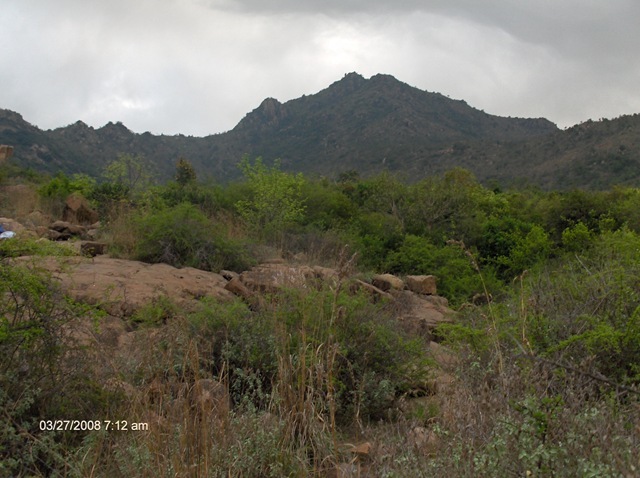 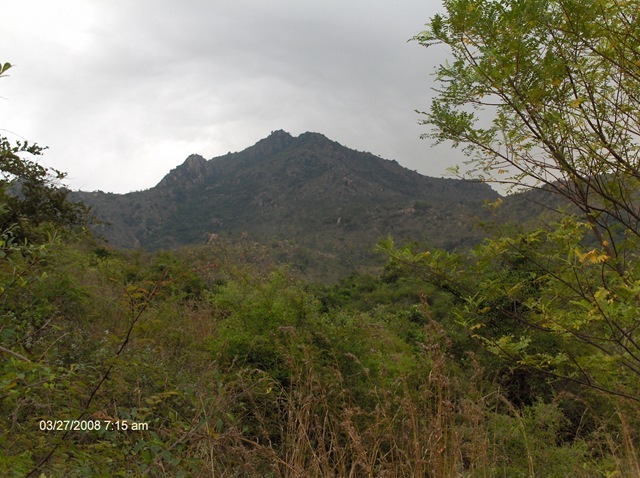 I wanted to live on the SW side of the mountain because the forested area at the base of the hill interested me, as does this side of Arunachala. 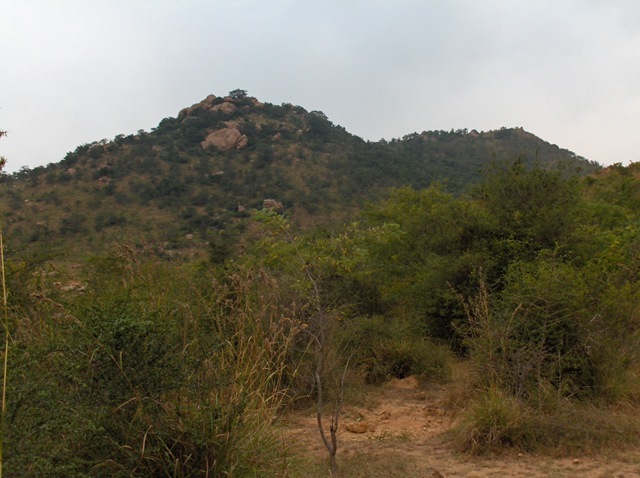 The pictures here are from a walk we took this week from our house up to Papaji’s cave. 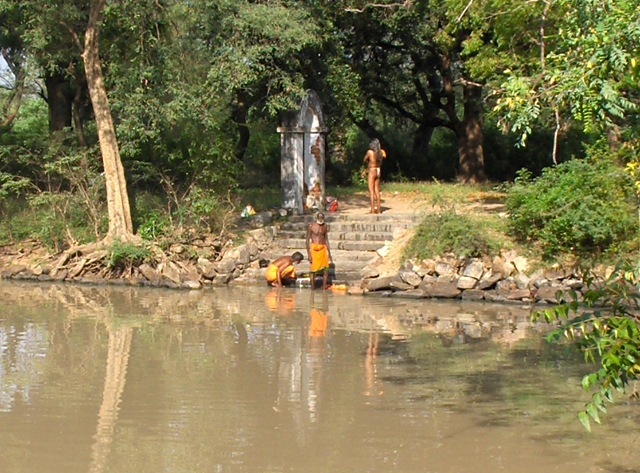 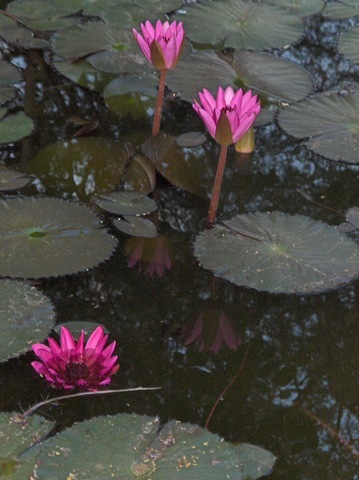 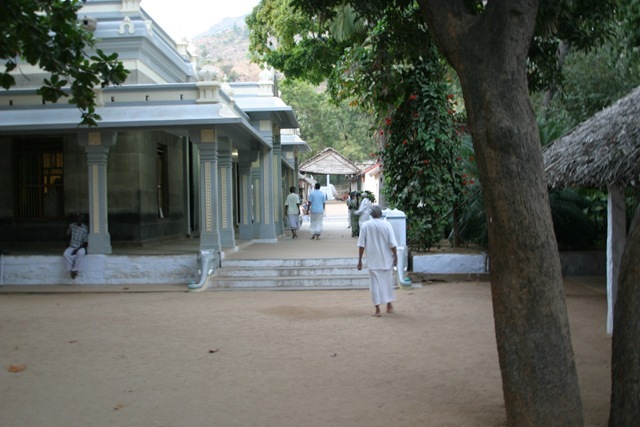 It takes about 30 minutes to get to the side path off the inner pradakshina path, then another 30 minutes up the hill. 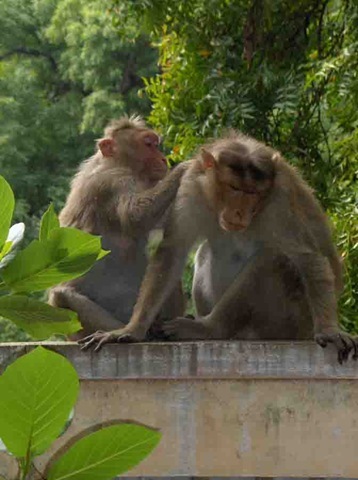 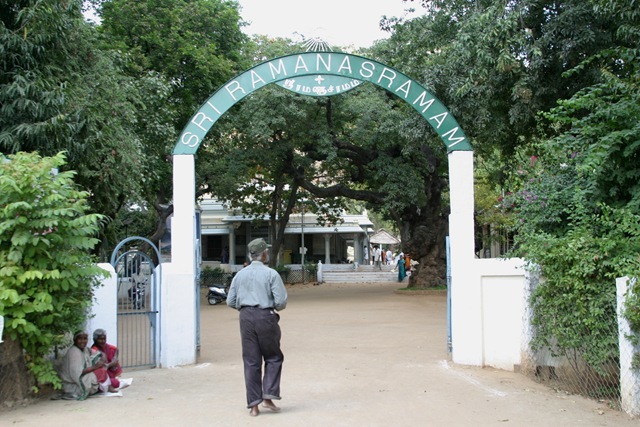 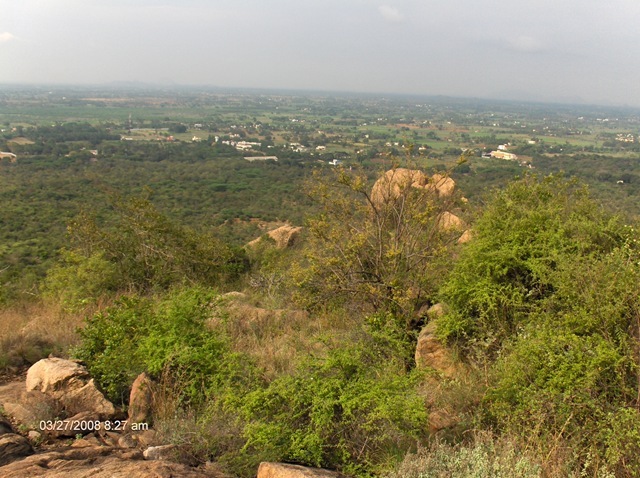 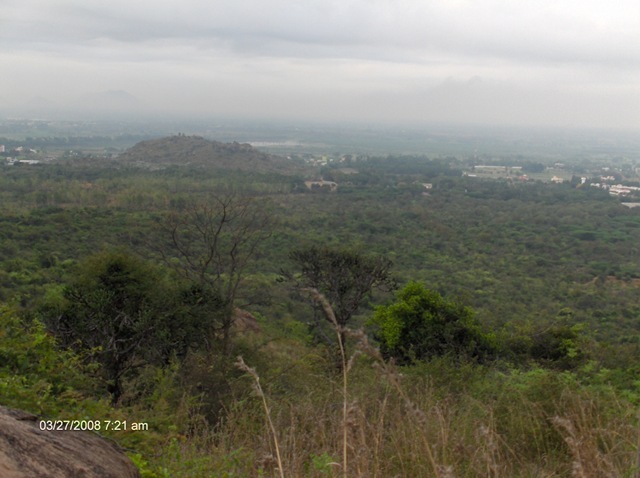 To get to the path from where we live, we walk out to Bangalore Road and then walk in towards Tiruvannamalai. 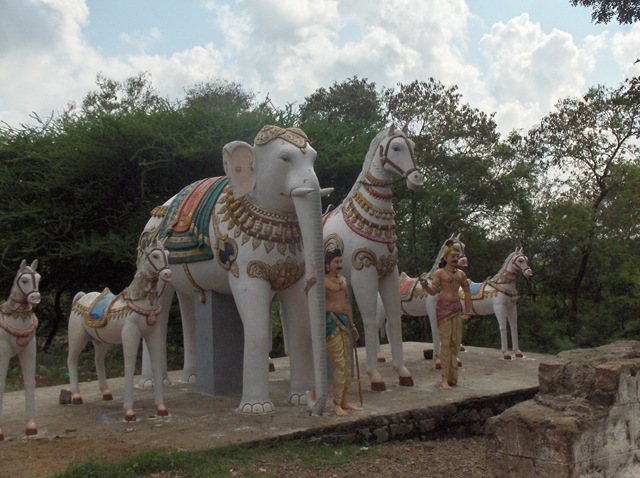 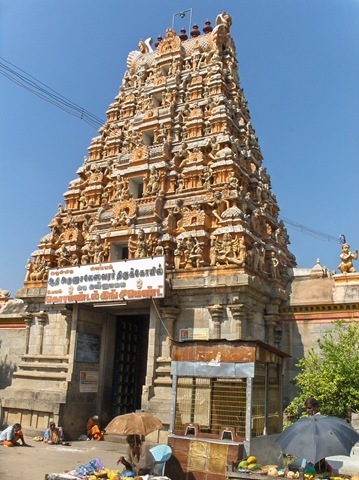 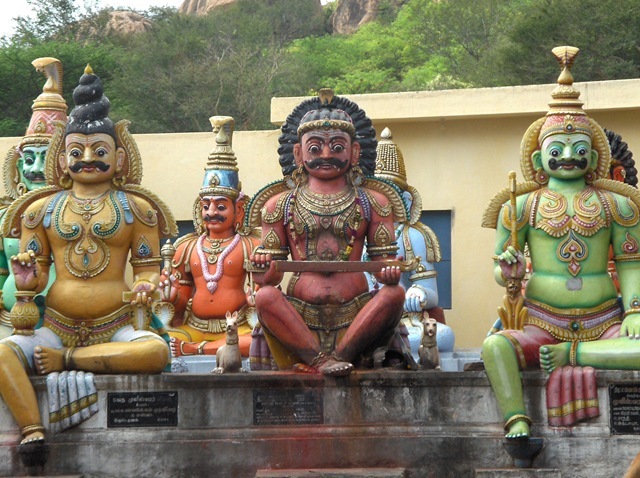 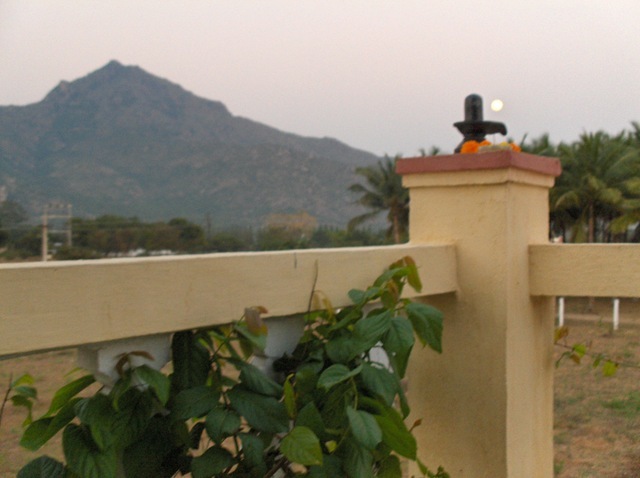 Just before where the pradakshina road turns off of Bangalore Road there is a Nandi, shown above, pointing to Arunachala. 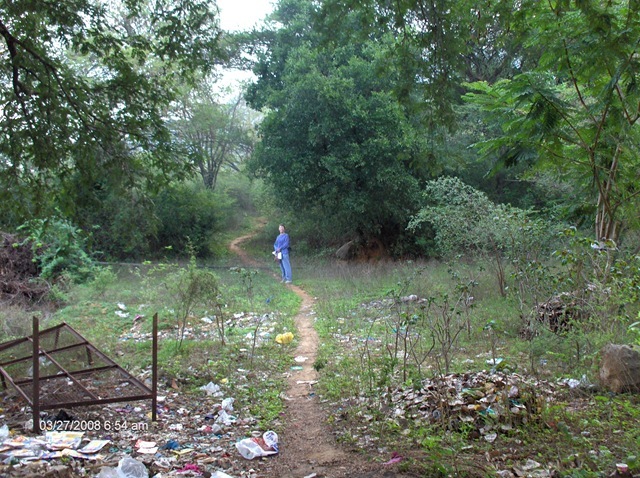 On the other side of the road is where the path starts. 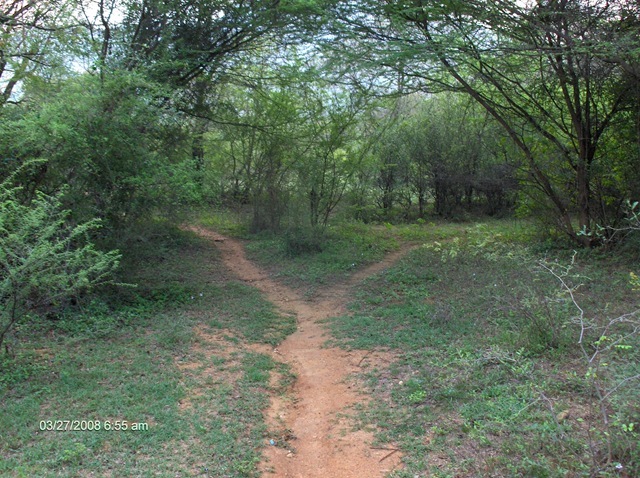 Follow the trail to the left. 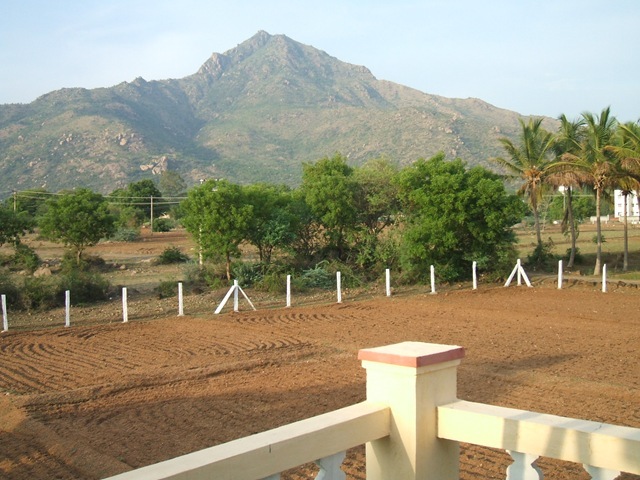 Everywhere here, Arunachala dominates the horizon. 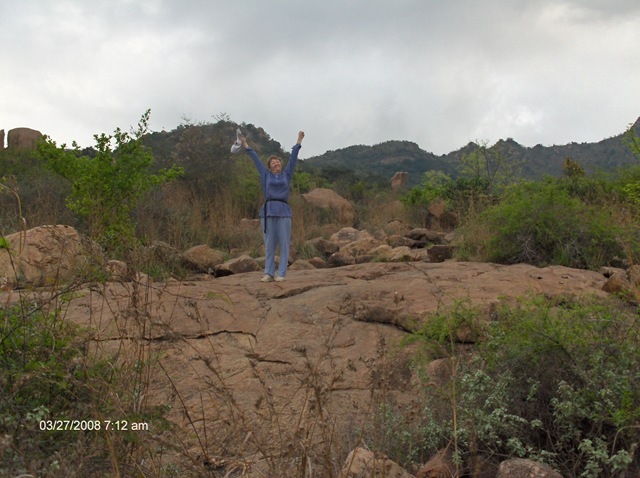 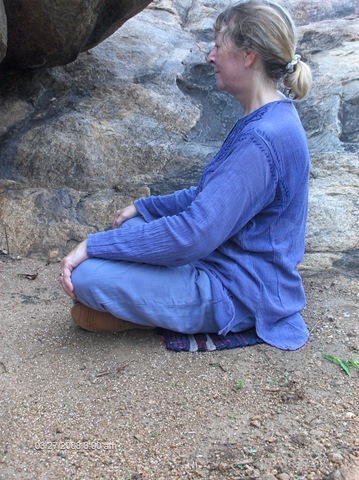 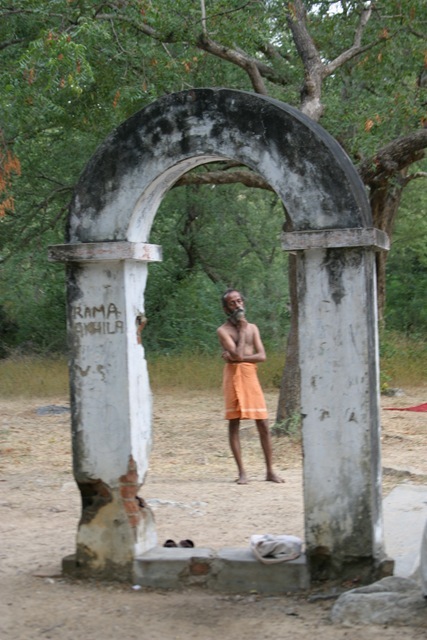 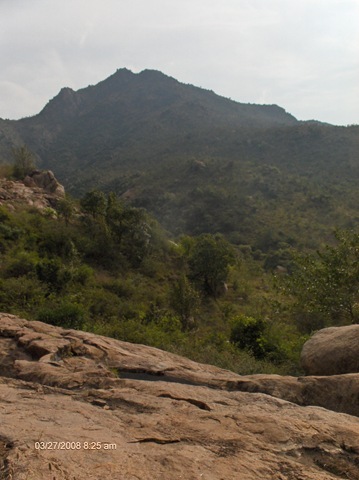 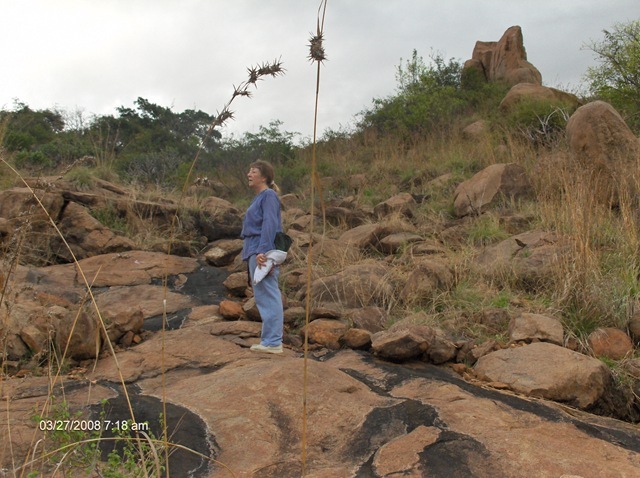 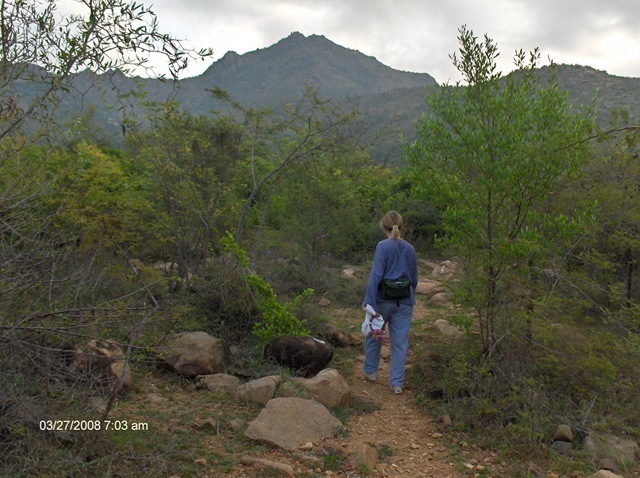 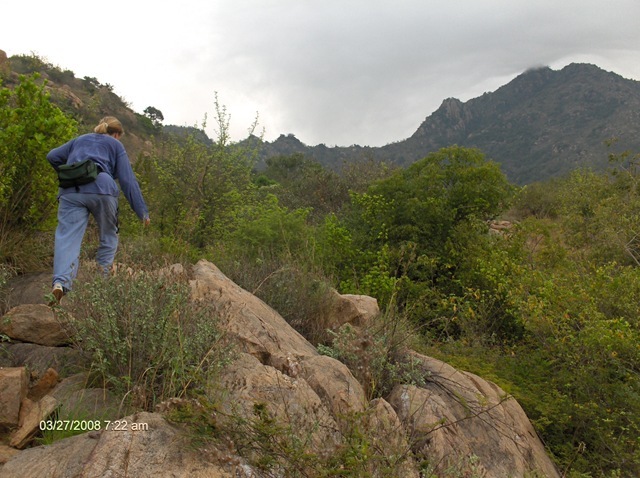 Carol, my wife, is shown above walking up the path with Arunachala in the background. 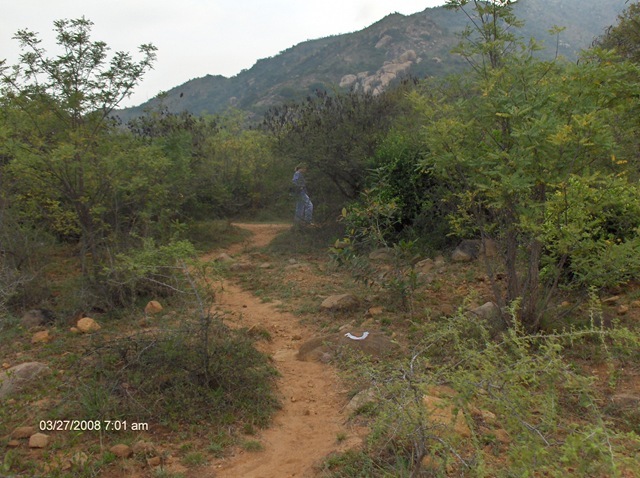 Notice the trees by the path here. 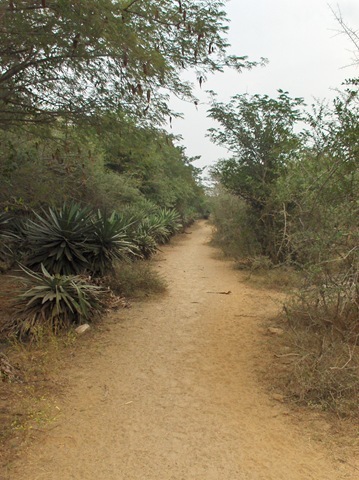 They were planted long ago, I guess as shelter for this access path. 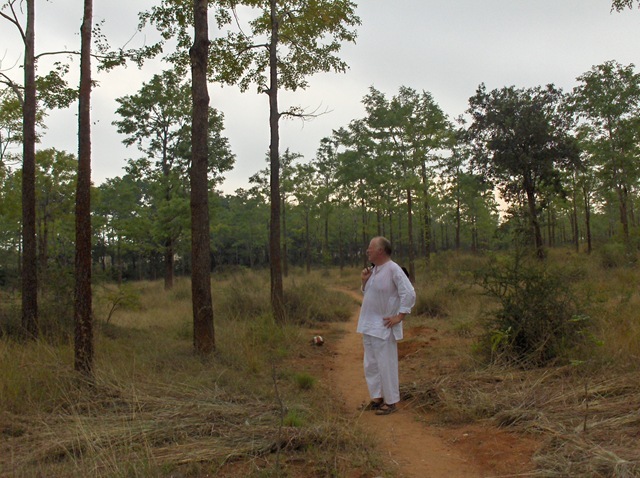 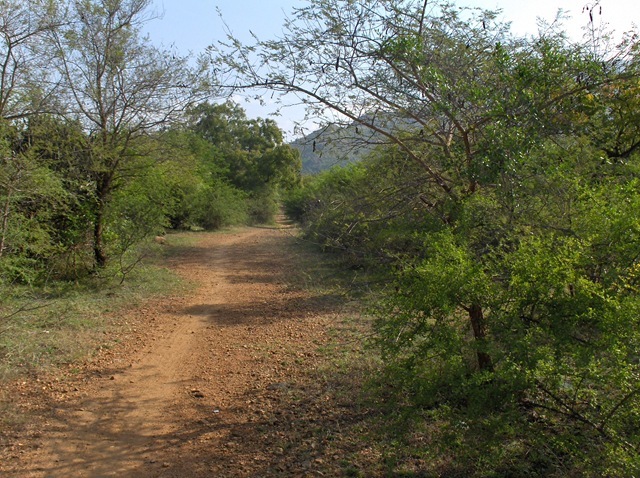 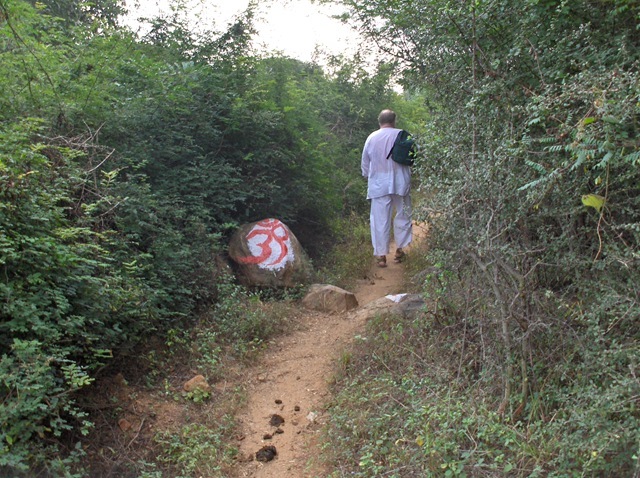 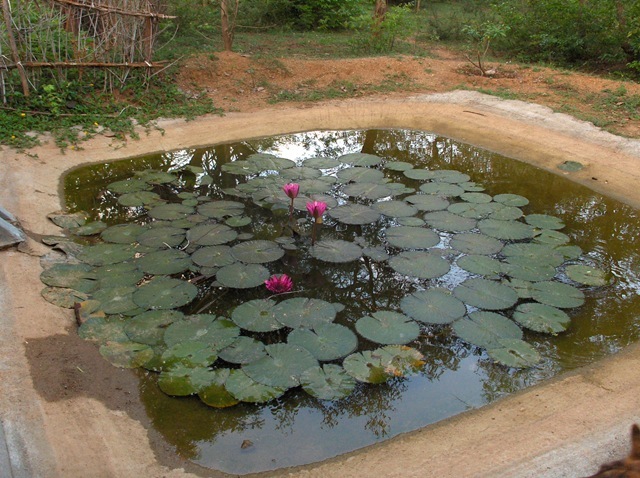 This path is marked with ‘trail markers’ for the pradakshina path (A white ‘cup’ holding a red ‘flame’). 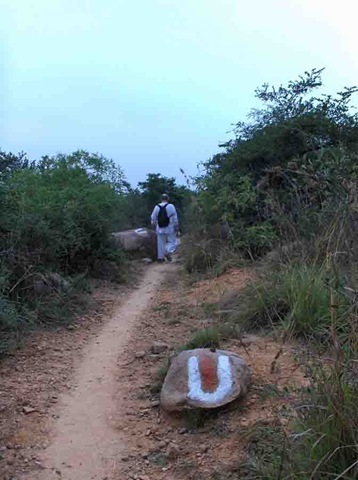 When we get to the inner path, we turn right and go against the usual clockwise pradakshina direction for a few hundred feet until we see the Om marker on a rock. 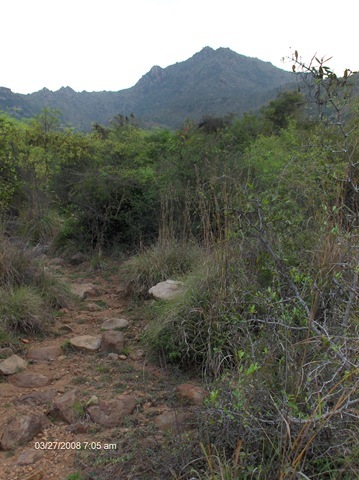 We then turn left towards the mountain. 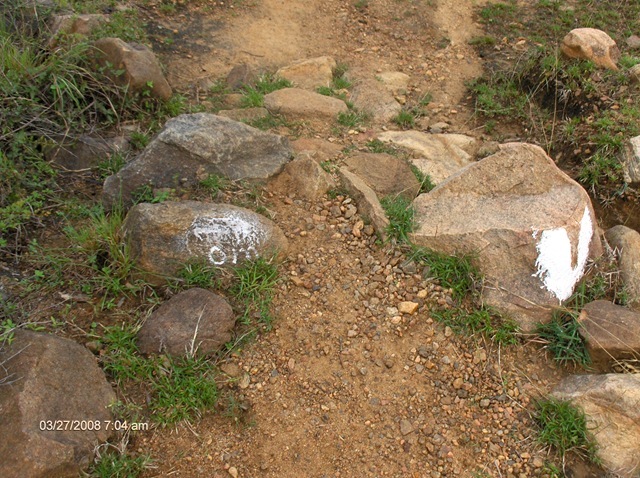 Where this path starts there is another Om Amma mark with an arrow. 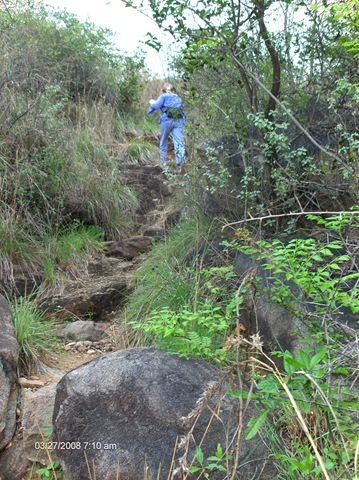 From here the trail gets more difficult, but is still pretty easy to walk and climb up. 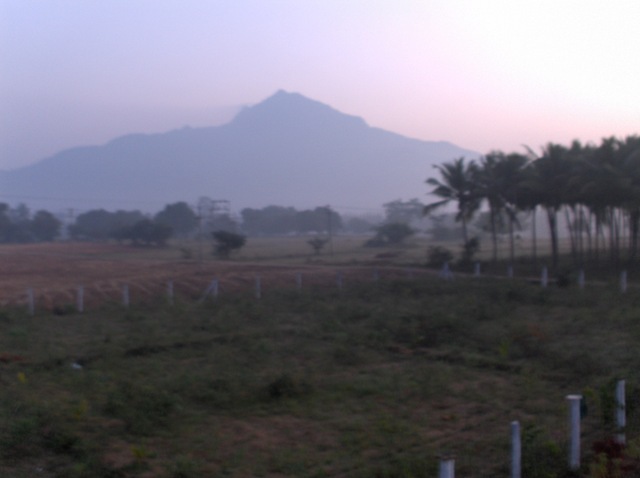 As always, Arunachala forms the background (and the foreground and is Reality itself). 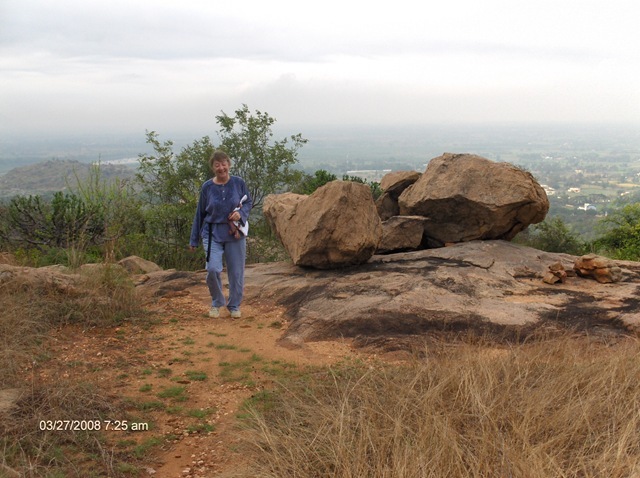 About half way to Papaji’s cave starts one of several sections where you walk up over big rocks. 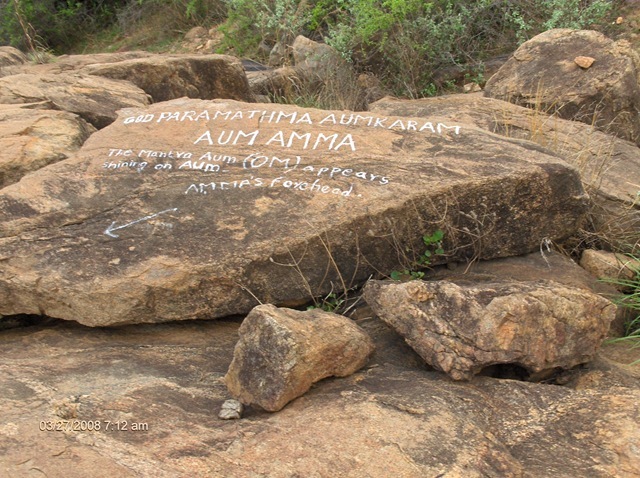 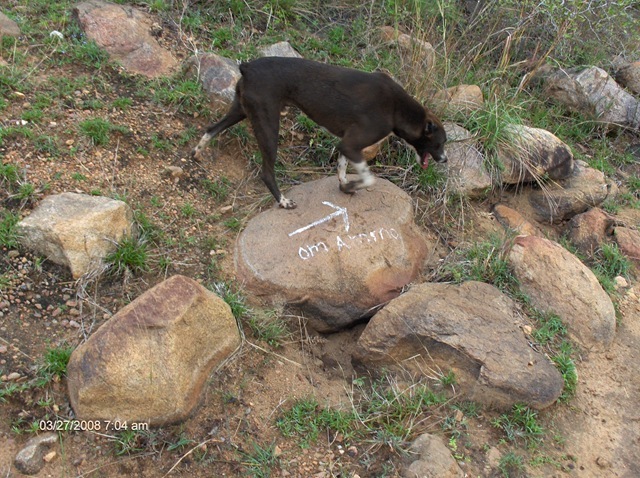 On the first of these, where Carol is signifying, “I did it” there is more painting on a rock about Aum Amma. 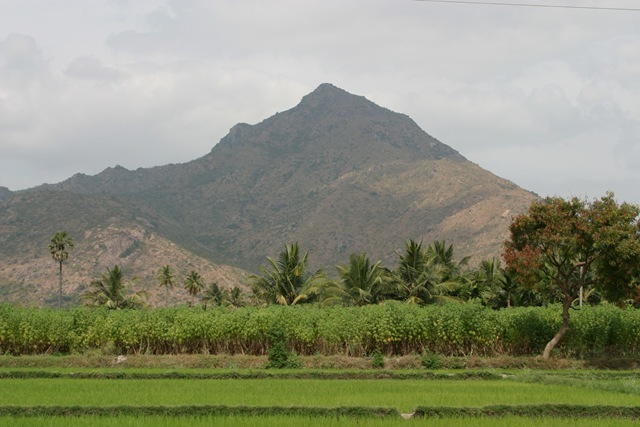 And as always Arunachala stands as the substrate to all. 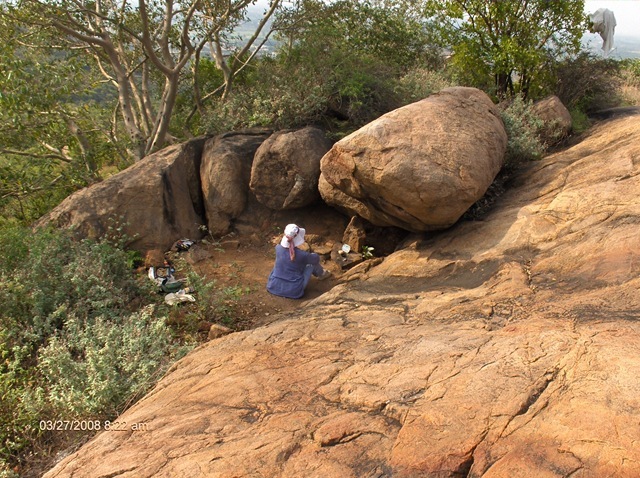 We climb over one more big rock and there, past two small pools of water that are labeled in white paint, ‘drinking water’, we can see the ‘cave.’ It is small, not really what most people would call a cave, just a sheltered space beneath a rock. 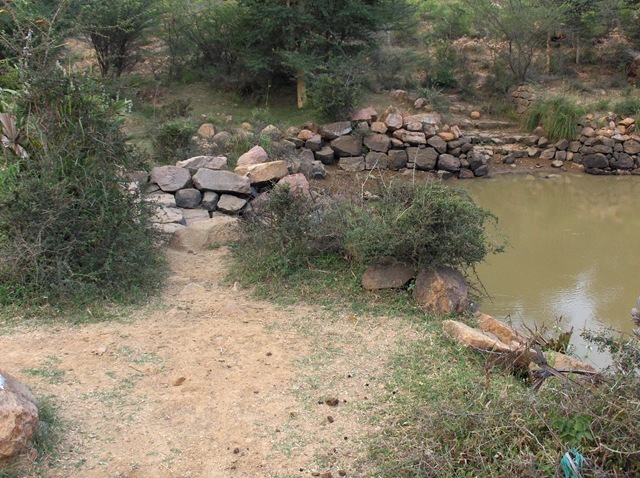 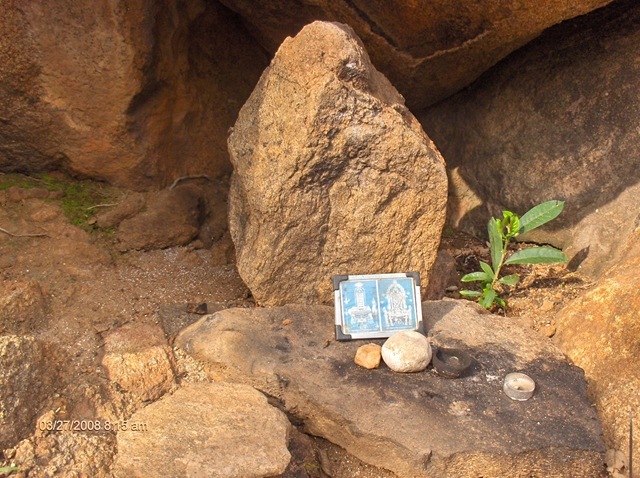 An altar has been created there out of rocks from the hillside. 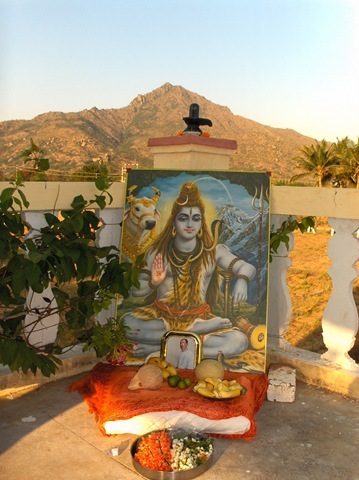 There are a few things on the alter, as well as a ghee lamp and a burnt out candle. 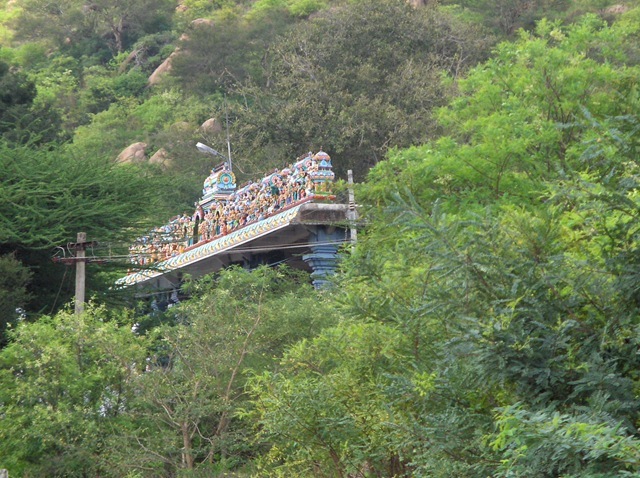 Sometimes you see flowers draped over the altar. 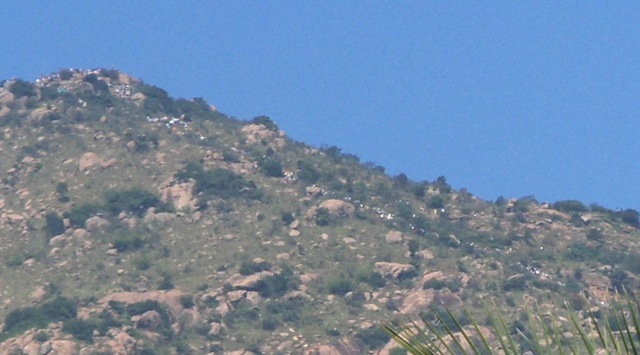 Not today though. 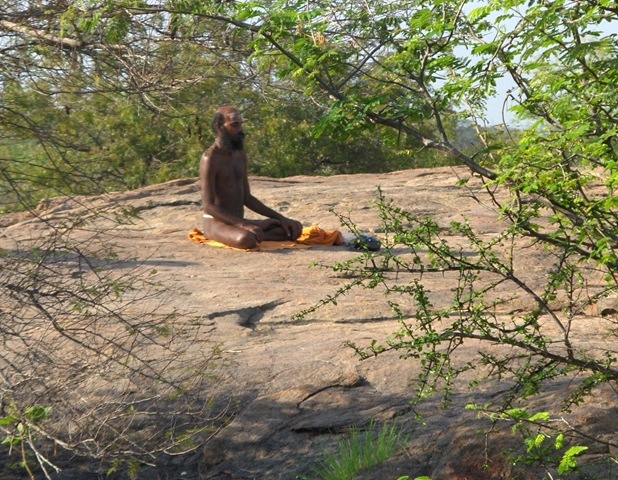 This is a very good place to sit and meditate. 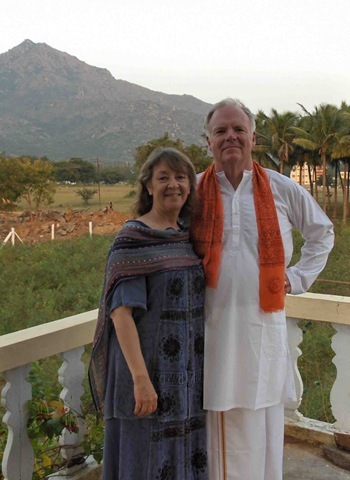 Carol and I both take advantage of this. 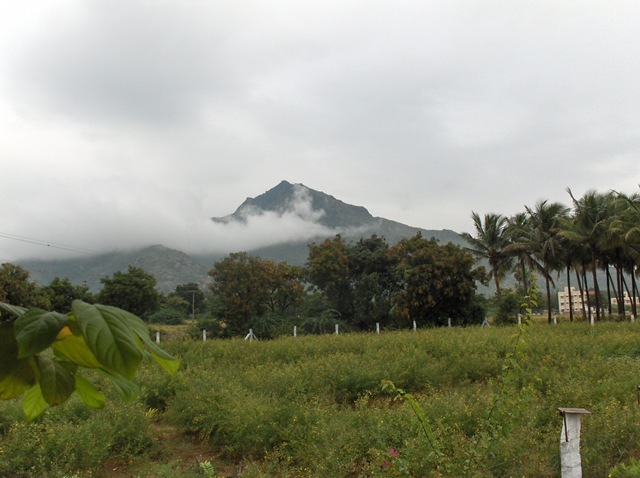 Here is Arunachala from Papaji’s cave. 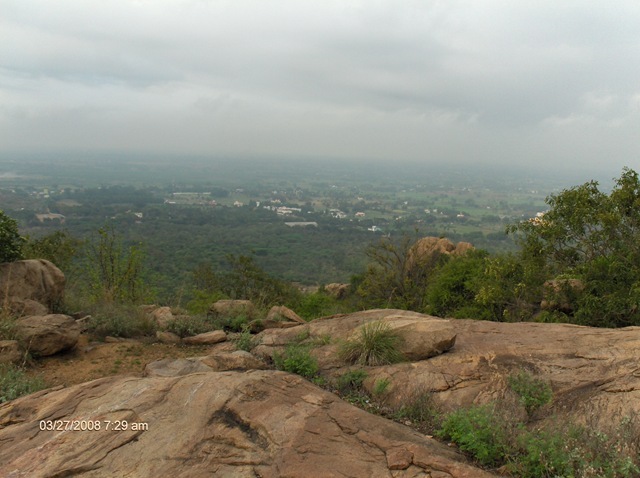 Looking down from here, one can see the surrounding area. 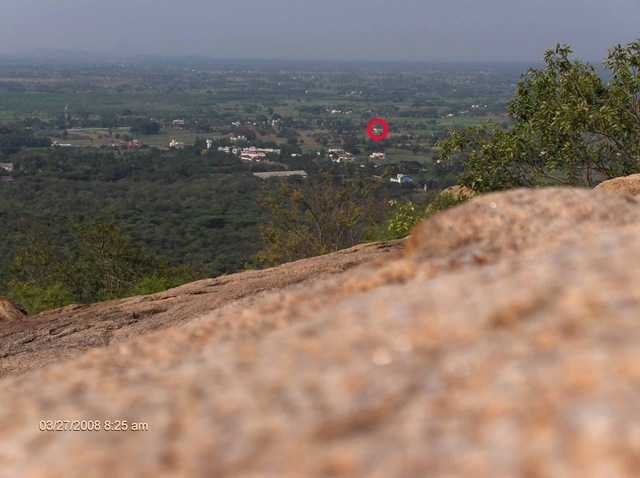 And in the red circle is ‘yenga veedu’, our house. 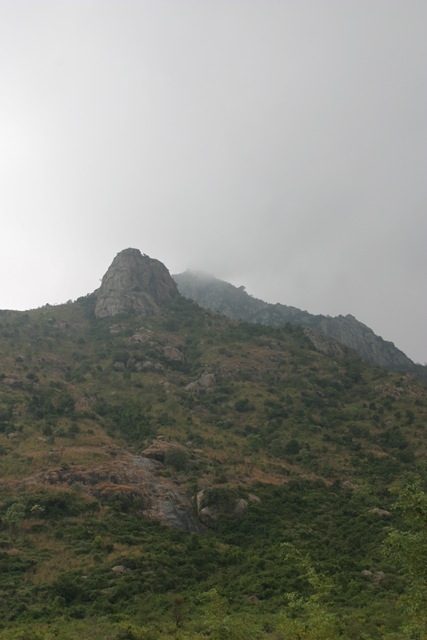 One last look at Arunachala, and we make our way down the path. 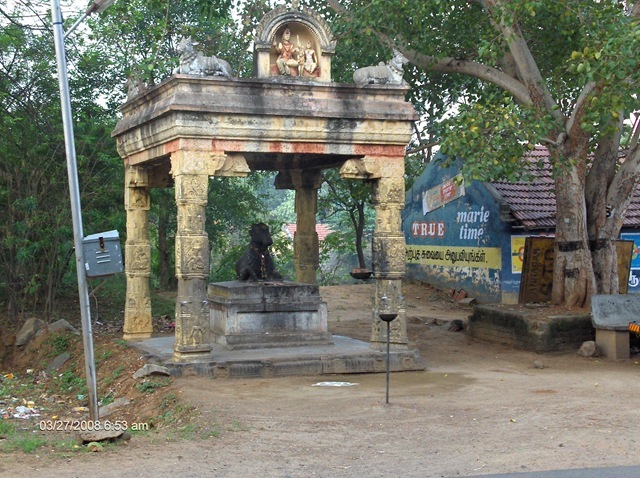 Walking home we usually stop at ‘The three star hotel’ (Aruna Annai??) 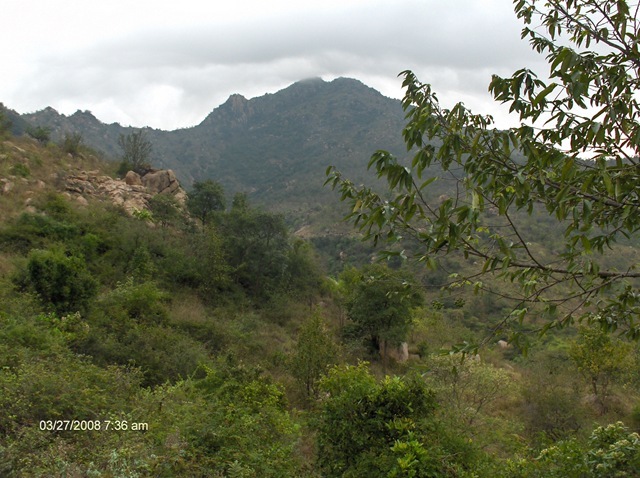 and have a cup of Indian Coffee ). 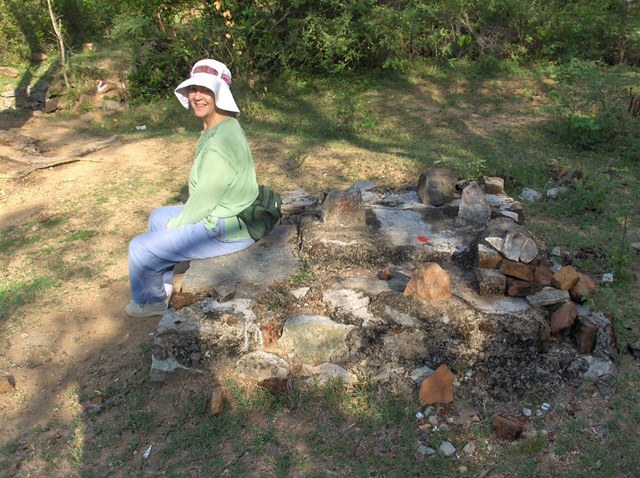 Often there are other Westerners here and we will chat with them a bit. 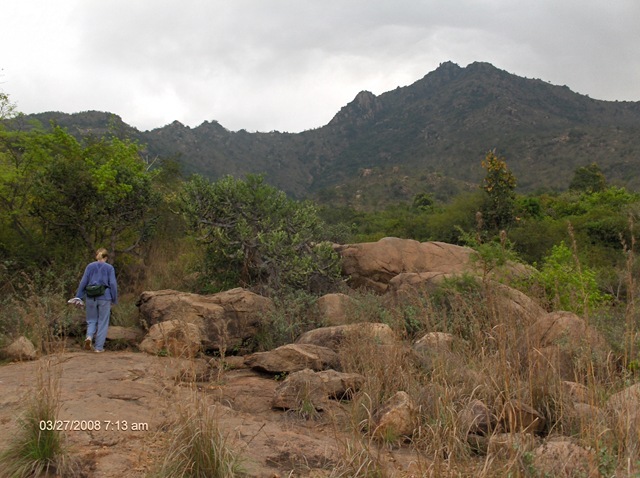 Then the short walk home.